If you are making a special journey to see or be hauled by a specific locomotive please check to avoid disappointment. This roster only relates to diesel workings. A list of ELR events is shown further down the page. See the ELR Website for the full running schedule. Shown in brackets and/or italic text. These trains are included for information only, it is not possible to travel on these unless you are a participant, invited guest or ticket holder for that service. See the ELR Website for more about booking a course yourself! While every effort will be made to ensure the rostered locos or units are available and running to the advertised timetable, the ELR reserves the right to cancel or terminate any service or use alternative motive power without prior notice. The East Lancashire Railway has some substantial gradients, the PDF Gradient Profile document details these and mileage info. Click the image below to view or download. 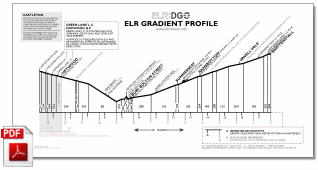 Learn more about the ELR route and operations at the About The Line page.